Every January the eyes of the watch world focus on Geneva for the annual SIHH (Salon International de la Haute Horlogerie) show. The show houses a handful of independent brands like MB&F and Ressence, as well as the Richemont group of watchmakers, which include the likes of Cartier, Panerai, and Jaeger-LeCoultre, among others. This year saw new releases that span from deep into six figure territory down to mere mortal territory. Of course, there was some controversial releases thrown in for good measure. Here are some of our highlights from this year, including thoughts from everyone on the watch team. This is not a comprehensive list of all releases this year, just handful that we find interesting or otherwise noteworthy. IWC came with a robust range of new Pilot’s watches this year, including new Top Gun models, a lovely Perpetual Calendar Le Petit Prince, and a revamped Spitfire collection. It’s that last group that catching all the attention on this end. The new Spitfire models come in either steel or bronzed cases, feature new in-house movements, including a 39mm time + date model being offered for well under $5k, and a 41mm chronograph coming in a hair over $5k. There’s also a UTC, a Worldtimer, and even a Perpetual Calendar included in the new family, but we see the more accessible models as the real hits here due to being well sized, well priced, and well equipped. Learn more about the releases from IWC here. We were treated to a new Gyrotourbillon watch dubbed “Westminster” from JLC this year, making it the 5th multi-axis tourbillon from the brand. As the name suggests, this watch will chime the hour and minutes, and in case that wasn’t enough, there’s a perpetual calendar complication present as well. Pricing falls into the “if you have to ask” territory, but they also introduced a trio of new Master Ultra Thin watches with lovely blue enamel dials and moonphase complications. All priced well under $100,000. Learn more from JLC right here. German brand A. Lange & Sohne is celebrating their 25th anniversary (since reorganizing), and revealed a special Lange 1 with a hunter caseback and blue detailing on the dial and movement. It’s a fitting watch for the occasion, but that’s not the watch drawing the most attention. That honor would fall to a new Datograph Perpetual Tourbillon with Salmon dial (side note: salmon dials seem to have gone mainstream). The watch may not be entirely new (this model was first released in 2016), but the addition of the new dial color coupled with the absolute unit of a movement, make the watch difficult to ignore. Just 100 examples will be built, and pricing is north of $250K. Learn more from A. Lange & Sohne right here. Panerai went all in on the Submersible this year, creating a new family for the line to live outside the realms of the Radiomir and Luminor. Nearly a dozen new Submersible models were introduced this year, making use of a variety of colorways and materials such as carbon. New Mike Horn editions are part of the new batch, with sizes ranging from 42mm to 47mm. These aren’t for the faint of heart, but they are certainly high on the cool factor and unquestionably technically robust. Learn more from Panerai right here. One of the most impressive technical innovations we’ve seen in a long time came out of Vacheron Constantin this year in the form of the Traditionnelle Twin Beat Perpetual Calendar. This is a watch that features dual oscillators running at different rates, and allows for the user to select which to engage. Depending on the selected beat rate, the power reserve can range from 4 days to …65 days. Yeah. Alongside this technical tour de force VC released new Ultra-Thin Overseas Perpetual Calendar watches that are totally beautiful. Learn more from Vacheron Constantin right here. Providing much of the controversy at this year’s show we have Audemars Piguet, which released an entirely new collection dubbed Code 11:59. 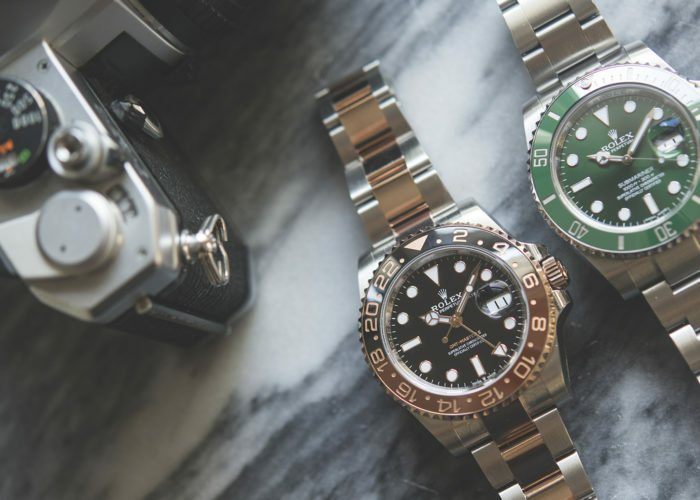 Everything about these watches is new, including the cases, movements, and dials. For better or worse. Moving to more familiar ground, there were also new Royal Oak Chronographs in 39mm, and even a new “Jumbo” Royal Oak with Salmon Champagne colored dial. The later is a limited ‘boutique only’ edition, but the former should be more accessible, and in a variety of colorways, including panda and slate grey dials. Learn more from Audemars Piguet right here. To breakdown our favorites from the show, David, Jim, Jan, Hadjj, and Blake provide their thoughts on what they saw released this week. 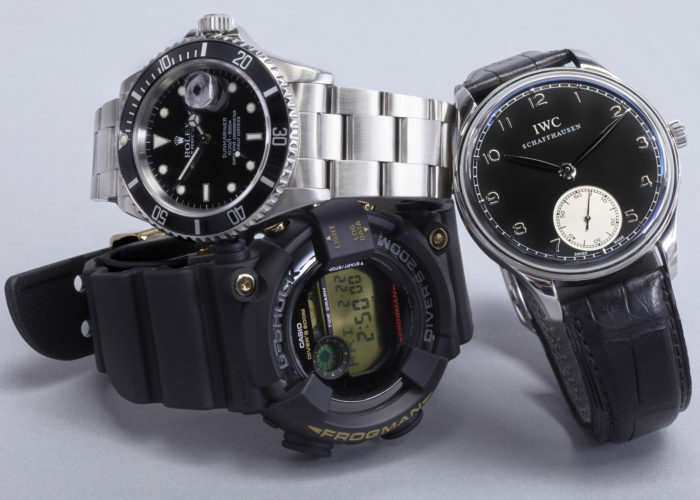 They’ll each give their top release of the show, the watch they’d be most likely to buy, and their guilty pleasure watch. David – The Vacheron Constantin Traditionelle Twin Beat Perpetual Calendar. While most of the US market has written off the oldest uninterrupted watchmaker, they come out with arguably the most intriguing complication in years. I still can’t wrap my head around the two independent balance wheels. 65 day power reserve? That is pretty amazing. Jim – H. Moser Swiss Alp Watch Concept Black. H. Moser has released some provocative unique pieces over the years, and the Concept Black is easily one of the most interesting. Taking something as complicated as a tourbillon and minute repeater… then removing the hands? Brilliant. You’re forced to stare into the deep black dial, while listening to its chimes to tell the time. Hadjj – The A. Lange & Söhne Datograph Perpetual Tourbillon Salmon Dial. As a newcomer into watches, I appreciate timepieces for their face value first, before going into depth of their mechanics. I’ve always been a fan of brown straps, mainly because of the classy look they provide to an outfit. From there, my eyes hit the details on the dial, specifically the stars that land on one of the complications. It’s the little details like that that really resonate to me, even adding the blue seconds hand that pops out on the salmon dial really makes this watch my favorite from SIHH. Blake – The Vacheron Constantin Overseas Perpetual Calendar Ultra-Thin. This watch hits all the right notes for me, from the blue dial, to the intricate case, and of course the ultra-thin case containing an ultra complicated movement. David – The Montblanc Heritage Monopusher Chronograph. If you told me that I wanted to buy a Montblanc 5 years ago, I, at least, would have laughed at you, and at most thrown a drink at you. That was then, this is now. I widely said that last year that MontBlanc was the brand that most impressed me at SIHH, and they are continuing to elevate the brand this year with a bevy of new in-house and Minerva produced movement references. My choice is the very affordable Heritage Monopusher Chronograph (Minerva movement). Minvera has a long history with the complication, so it’s nice to see them continue this tradition. Jim – IWC Spitfire Chronograph Bronze. The bronze trend clearly hasn’t died off and I’m OK with that. The new IWC Spitfire Chronograph in bronze is an excellent addition to the IWC line, and one I’d be willing to buy. Bronze watches are nothing new, but for the most part they’ve come in the three hand variety. We’re starting to see more chronographs cased in this particular metal and it works very well. Hadjj – IWC Spitfire Automatic. I tend to talk about how I love a good watch with a lot going on, but in reality, I never feel like I can pull them off. The Spitfire, has everything I need with a very straight-forward design on the dial. What more could you ask for? 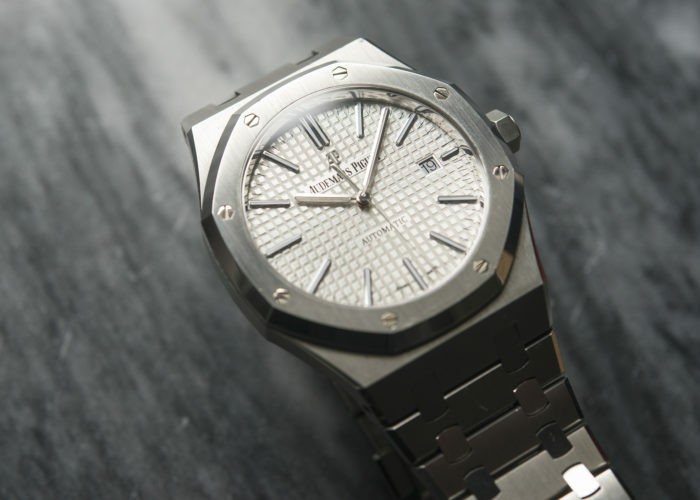 Blake – Audemars Piguet Royal Oak Chronograph. A 38mm RO Chronograph with panda dial is probably the most me watch to be released at this year’s SIHH. It’s sporty, but there’s enough detail going on to keep you fascinated everytime you look at it. The size shows an element of restraint that I appreciate, and gives it an everyday wearability that I need in my collection. David – Richard Mille Bonbon Collection. I’m not a huge fan of Richard Mille, my tastes run a bit too conservative, but I have to say, the Bonbon collection has me thinking twice. For an industry to sometimes takes itself way too seriously, here’s to Richard Mille for bringing some fun back to the show. Jim – Lange Zeitwerk Date. The Zeitwerk has been a signature watch from Lange for a decade. It’s original, it’s revolutionary and it’s just plain cool. Now add to the functionality a date? Grail. The movement from Lange is drop dead gorgeous and to fit this entire package in a 37mm case and only 8.9mm thick is quite the acomplishment. Hadjj – The ‘Le Petit Prince IWC Pilot. This watch has it ALL! First off, my favorite watch is a classic black dial Daytona. When I saw the push pins, I was instantly hooked based off of its similarities to the classic Rolex. Next, that very very clean gold just grabs me in. I think it adds to the watch’s flashiness and will instantly boost your confidence. Blake – The Jaeger-LeCoultre Master Grande Tradition Gyrotourbillon Westminster Perpétuel. Every Gyrotourbillon built by JLC sits at the height of just-too-muchery and their latest efforts top them all. The dial itself is entirely legible and practical, with apertures for the day, month, and year sitting neatly at the edges. Wandering beyond that, the dial is filled with pure decadence, including the visible chiming function, and you know, the massive rotating tourbillon cage at 6 o’clock. That’s not all there was to this year’s show. A few watches caught our eye that don’t fit into the above categories, but we think they’re worth a mention. Ressense Type 3W – The Type 3 has been around since 2013, but the latest release brings a silver dial to the mix, and it’s absolutely fabulous. Hermès Arceau L’Heure De La Lune – One of the most beautiful takes on the moonphase complication in recent memory. The floating dials create an ephemeril presence of the layered moons underneath. Ulysse Nardin Freak X – This is the most accessible Freak UN has ever created, not only in price (starting just north of $20k), but in stature as well, coming in at a reasonable 43mm.